Bruce brings unparalleled quality and excellence knowledge, previously working to help Florida Power and Light to win the coveted Deming Prize for Quality in 1988 – the first time a non-Japanese firm was ever recognized with such an honor. 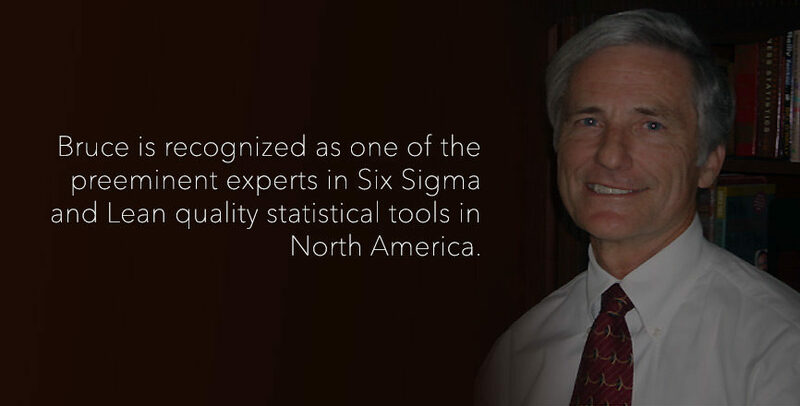 Bruce is recognized as one of the preeminent experts in Six Sigma and Lean quality statistical tools in North America. For the past 25 years, he has provided Master Black Belt-level consulting to lead process improvement and re-design efforts, as well as on-site, curriculum-driven training classes to client teams for yellow, white, green and black belt level certification. He has enabled client organizations to implement process-level changes driving seismic improvements in customer satisfaction, product and service quality, and cost savings. His client sectors span healthcare, federal/state/local governments, military, non-profit associations, utilities and manufacturing. Bruce also works with client organizations seeking pursing the Baldrige criteria, as well as state-level award programs. Bruce earned a degree in Electric Engineering from Georgia Institute of Technology and an MBA from Stetson University.